The painted mosque [Lattan masjid]. bl.uk > Online Gallery Home	> Online exhibitions	> Asia, Pacific and Africa Collections	> The painted mosque [Lattan masjid]. Also known as the Lattan Masjid and termed 'painted' from the fact that its walls were cased both inside and out with glazed bricks, wrought in different patterns, and coloured blue, green, yellow and white. This mosque was founded in 1475 by Sultan Yusuf Shah, sultan of Bengal, who ruled from the capital at Gaur. 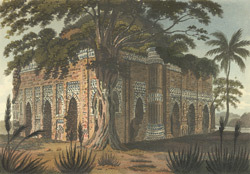 The brick-built mosque comprises a single domed chamber, with three recessional prayer niches, and a verandah to the east. The verandah is roofed with two domes and a central 'chahar chala' vault derived from local architectural precedents.